A white jewelry box blends with classic, cottage or contemporary styles. Choose from designs styled for women or girls that feature necklace storage, ring rolls and divided earring compartments. Some styles are musical or include automatic lift trays, or a lock and key. If you don't see the white wood jewelry box or white wood armoire you are looking for, contact us. 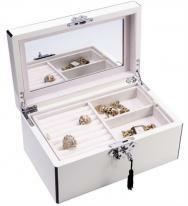 All white jewelry boxes qualify for easy 30 day returns and 1 year product warranty.